Cognac is a fine French brandy (eau-de-vie) from the region that surrounds the little town of Cognac in southwest France. Like champagne, its mere name suggests luxury and indeed it is the undisputed king of all brandies. This is a picturesque part of France with rolling countryside, tree groves and the Charente River meandering across the region, along the way fed by the Né, Antenne and Seugne rivers. The climate is mild with an annual average temperature around 13°C (55°F). Its northerly situation meaning that the grapes ripen slowly and evenly so generation the right balance of fruit and acidity required for distillation. Cognac was one of the last areas in France to distil brandy but the region had long been involved in international trade and from as early as the 5th century was a major producer of sea salt for preserving fish. The region's grapes produced inferior wines but these acidic wines proved to be excellent for distillation. It seems likely that the first eau-de-vie were distilled for use in fortifying wines, and sent down the Charente river to the Atlantic ports. 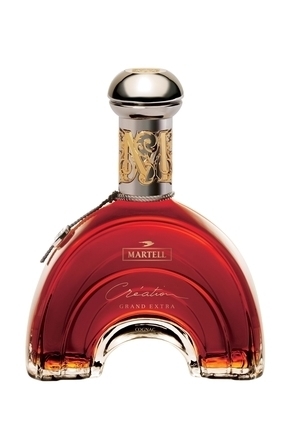 The region's brandy quality improved dramatically with the introduction of double-distillation, developed by one Marron seigneur de la Croix, later known as the Chevalier de la Croix-Marron, who retired from military service to his property in Segonzac, in the heart of the Cognac region, in 1610. Another development came from the discovery that extended storage periods of the brandy in oak casks also dramatically improved quality. Two casks of eau-de-vie were delivered to the Renorville Monastery but only one was tapped and the other stored away until the occasion of Bishop of Saintes' visit to the monastery some 15 years later. The monks discovered that a significant share of the brandy had evaporated and that the normally colourless brandy had taken on an amber hue. The brandy was noticeably smoother and more palatable. The better quality brandy produced by double distillation and aging drove demand and the start of serious production with the first written reference to the name 'Cognac' being applied to the region's brandy in 1638. The Cognac region has been recognised as an Appellation of Origin since 1909 and production and marketing of cognac are tightly controlled under French Appellation d'Origine Contrôlée rules established in 1938. The delimited cognac appellation covers a total area of over one million hectares (1,095,119 ha), but of that only 79,636 ha is actually under vineyard with approximately 95% of those vineyards, some 6,200, used for cognac production. The Cognac region is divided into six sub-regions (crus), reflecting variations in climate and soil as described by the geologist Henri Coquand in 1860. These sub-regions which were ratified by decree in 1938. 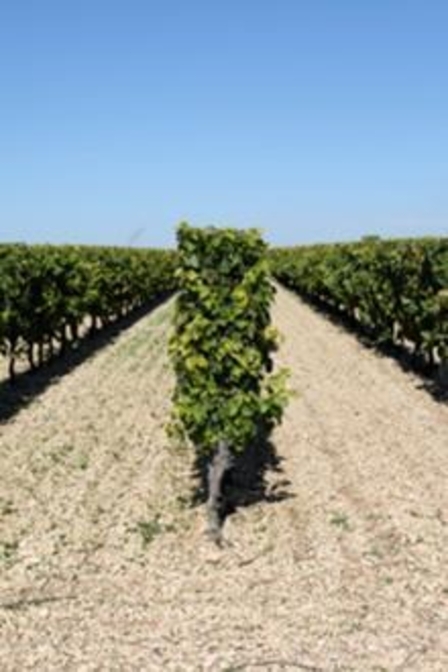 As a general rule, the finest have more chalk in their soil and are at the centre of the region with the most regarded region, Grande Champagne, having only a very thin layer of top soil over solid chalk so the vine routes have to force their through the chalk to find water. 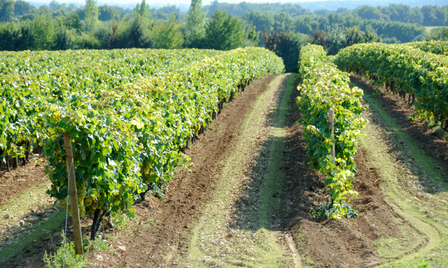 Unlike in other winegrowing regions, irrigation is not permitted in the Cognac appellation (expect for the first year after planting). The Crus received their names when the local forests were cleared at the beginning of the 19th century, hence the reference to woods in some of the area names. In order of importance these are Grande Champagne, Petite Champagne, Borderies, Fins Bois (fine woods), Bons Bois (good woods) and Bois Ordinaires (ordinary woods). The top (premier) cru centres on the town of Segonzac and spreads out north and east. Champagne cognac has nothing to do with champagne sparkling wine, which is made many miles away, but their shared name probably comes from the Latin 'campania', which means broad, rolling, open countryside. Fine Grande Champagne - is a term that can only be applied to Cognacs made from grapes grown in Cognac's Grande Champagne region. To the south of Grande Champagne, and extending west of Segonzac, this is the second finest cru. Fine Champagne Cognacs must be made only from a blend of Grande Champagne and Petite Champagne, with at least 50% of the blend coming from Grande Champagne. Borderies cognac tends to be nutty as opposed to the Christmas cake-like flavours associated with the Fine Champagnes (made from the two Champagne crus). Floral flavours, particularly violet are also associated with Borderies. Some claim that Borderies matures more gracefully than Grande and Petite Champage. The largest of the cognac regions surrounds the first three crus. The name means 'fine woods' since when the vines were planted much of this area was wooded. Fins Bois is favoured for producing younger blends. Meaning 'good woods' although again little of this area remains wooded, Bons Bois surrounds the Fin Bois region. Wine from Bons Bois now rarely finds its way into the cognacs produced by the major houses. This cru includes two areas, one to the northwest, including the islands of Oléron and Ré, the other to the northeast of Segonzac. The name means 'ordinary woods' (although the woods have long been cleared) and the vineyards' sandy soil and closeness to the sea impact unfavourably on their wines. Ordinary by name and ordinary by nature, this is the least important of the six areas and its eaux-de-vie are rarely even considered for use in cognacs made by the major houses. Three kinds of grape are grown in cognac: Ugni Blanc, Folle Blanche and Colombard. Before the phylloxera louse killed off the vineyards at the end of 19th century, Folle Blanche was the most popular grape. Today, due to its resistance to frost, pests and 'grey mould', over 95% of grapes grown in the region are Ugni Blanc. This late maturing variety produces a wine with high acidity and a relatively a low alcohol content. Since the phylloxera plague all the varieties used have been grafted onto various different rootstocks selected according to soil type. Chemical products like Sulphur Dioxide which are routinely added to wines in many other wine regions, would be detrimental to distillation so are not permitted in cognac production so Ugni Blanc's high acidity is vital in helping preserve the wine prior to distillation. A few cognac houses still use some Folle Blanche as they believe it adds elegance and lightness to the blend. Colombard is now only generally used for Pineau des Charentes. Typically a vine will produce good grapes for around 25 to 35 years, and produce its best grapes aged around twenty. When the vines are too old and tired they are grubbed up and replaced. According to the rules of the cognac appellation the soil must be left to rest for three years before it can be replanted with new vines. The new vines must be left for four summers before the grapes can be used for the production of cognac. Harvesting begins as soon as the grapes reach maturity, typically at the beginning of October and the harvest will generally be completed by the end of the month. Harvesting is now mainly by machines which vibrate the vines causing bunches of grapes to fall into the collection conveyors of the machine as it works its way up a row. Vertical continuous presses are not permitted to be used for the production of cognac and horizontal pneumatic bladder presses are now the norm, although some smaller concerns still use traditional basket plate presses. Chaptalisation (the addition of sugar to the grape juice) is forbidden by the Cognac Appellation. The grape juice is fermented using selected yeasts and after 5-7 days a wine of 8.5-9% alc./vol. is produced. Typically five grams of yeast is added per hectolitre in 800 hectolitre tanks. Nitrogen is also added to help start fermentation. Modern fermentation tanks are water cooled to keep the temperature within the fermentation window of 15-30°C. They may also be aerated to speed fermentation. Secondary flavours arising from the fermentation process include banana and strawberry. In hotter regions fully ripe Ugni Blanc grapes produce wines of 10-11% alc./vol. but even with global warming this is rare in the cognac region and the ideal strength for cognac distillation is 8.5-9% alc./vol. when the grape is more acidic. Most cognac houses will not distil wines which are over 9.5% alc./vol.. The stronger the wine, the more challenging the job of the distiller. Originally cognac alembics were heated by burning wood and then later coal but today natural gas is the fuel of choice. The appellation dictates that a naked flame must be used to heat the stills so effectively outlawing the use of electricity. The furnaces of Charentais stills are traditionally surrounded by brick with a sturdy iron door on the front through which the fire was stoked. Thus Charentais alembics look as if they are built on brick plinths. However, the cognac distiller's art is a complex one, one that balances gut feel, experience and science. The distiller must make a judgement between leaving as much of the grape's flavour in the final distillate as possible so running the risk of allowing impurities that may be detrimental to also boil over. Or rectifying the spirit by distilling to a high proof to make a 'purer' spirit and so inevitably lose some of the flavoursome elements which lie in the congers (a collective term for the impurities which include aldehydes, polyphenols and esters). This is the cognac distiller's paradox and it is affected by how much, how quickly and how evenly the still is heated and when the distiller makes the all important 'cut' (coupe). The cut refers to collecting the run of distillate from the sweet spot of the distillation. This is sometimes referred to as the 'middle-cut' or 'heart' but the proportion of the run that that needs to be collected actually tends to be nearer the start of the run. The first vapours that come off the still start at a high alcohol content and this gradually weakens to eventually just water vapour is given off at the end of distillation. The initial vapours produced are called 'the heads' and these are condensed and directed to a specific holding tank. The distiller must then judge when to start making the cut and divert the distillate to the main holding tank to become cognac. For the first distillation (première chauffe), the still used can contain up to 140 hectolitres of wine. Distillation typically takes twelve hours resulting in a final 'cut' distillate known as brouillis with a strength of 28-32% alc./vol.. The brouillis is then distilled a second time, known as the la bonne chauffe (the good heating). The stills used for la bonne chauffe are of the same design but tend to be smaller with a legal maximum permitted boiler capacity of 30 hectolitres which may only be charged with a maximum of 25 hectolitres of brouillis. The final distillate collected from this second distillation is called eau-de-vie and has a strength of 70%-72% alc./vol.. (The average strength of heads is around 80% alc./vol. and tails 30% alc./vol..) Each distillation takes around twelve hours and after each batch the still must be cleaned, meaning an hour or so delay before the still can be recharged and the next distillation begun. Chauffe-vin, a heat exchanging device which uses heat from the vapour from the still before it reaches the condenser to preheat the wine to be used in the next distillation. The obvious advantage being that this saves energy but detractors shun chauffe-vin as there is a danger of overheating the wine (above 40-45°C) and an increased risk of oxidisation. The pipe work involved is also difficult to clean so also risking contamination. Thus this is yet another option open to distillers which contributes to differences in the final distillate. On many traditional Charentais alembics the Chauffe-vin is easily spotted as a ball-like apparatus which sits high between the head of the still and the condenser. An eau-de-vie must spend a minimum of two years ageing in oak casks holding between 270 to 450 litres of spirit before it can be termed cognac and the eaux-de-vie. The most common size for modern day casks is 300 litres and some houses now have casks made with their bung holes at the barrel head rather than the side as there is a trend to towards storing casks upright on palettes. Cognac 'cellars' are well ventilated ground level buildings without windows, often with bare earth floors. The ageing process usually begins in new oak casks to add tannins to the brandy. After 18 months or so the spirit is transferred to an older barrel to continue ageing and picking up more subtle flavours from the older wood. Casks aged between 1-4 years are known as 'meures-meur', those aged 4-10 years are termed 'barriques rouges' (literally 'red barrels'), while those over 10 years old are called 'vielles'. Very old brandies (between 35 and 70 years) are moved into fifty litre glass demijohns when the cognac has reached the full extent of its maturation to prevent the spirit taking on bitter woody flavours and its strength dropping to below 40% alc./vol.. Cellars containing such very old cognacs are called paridis (literally paradise). During ageing, some of the eaux-de-vie evaporates - this approximately 2% loss each year is known as the 'angel's share'. Casks are topped up each year with cognac from the same batch to control oxidisation. The 'angel's share' alcohol vapours feed a microscopic fungus known as 'torula compniacensis' and this fungus covers and blackens the walls of the aging warehouses. 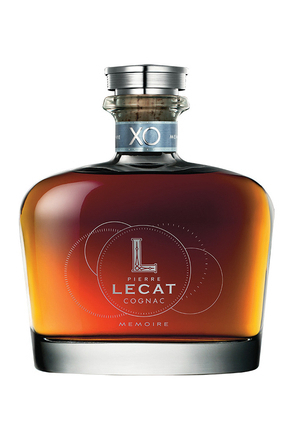 Typically cognacs are blended from numerous vintages across many different vineyards and crus. 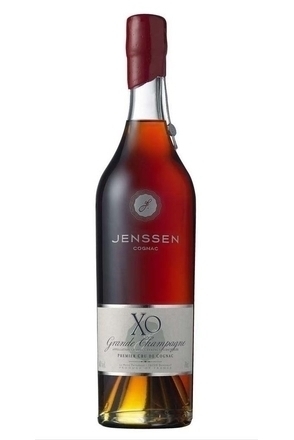 The better the quality of cognac the greater number of eaux-de-vie it is likely to be blended from with X.O. typically blended from at least a couple of hundred different eaux-de-vie. Blending the eaux-de-vie is a highly skilled craft comparable to the 'Master Nose' of a perfume house and Master Blenders serve lengthily apprenticeships before being given the task of maintaining a house's style. There are numerous ways of blending cognacs, and the process often happens gradually over a period of years, as spirits are moved from barrel to barrel and combined. 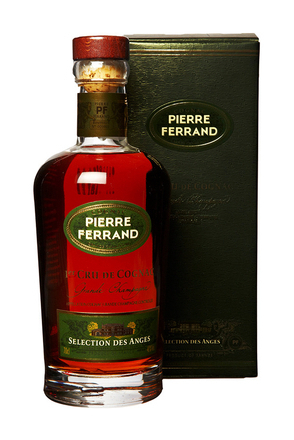 A cognac is sold at around 40% alc./vol. but emerges from the last distillation at 70%-72%. The eau-de-vie is first reduced to 65% alc./vol. before filling casks for aging to allow better wood extraction and the alcoholic strength will be further reduced by the addition of distilled water (or petites eaux - a mixture of cognac and water) during the ageing period. This tends to happen at approximately six monthly intervals, and is done slowly to allow the blend to marry. The older the cognacs are in the blend, the longer the period of hydration. Many will be surprised and some shocked to learn that permitted additives to cognac include caramel, for colour correction and consistency (as is commonplace with other aged spirits such as whisk(e)y), but additionally also sugar and boiseThis last additive is a dark goo made by boiling wood and reducing the resulting liquid which is used to give the impression of extended wood ageing. The addition of boise is no substitute for the gentle but profound effects of lengthy maturation and the best cognacs are made only from water, grapes and yeast. While the practice of adding caramel and even sugar are both accepted and commonplace (most cognacs have at least 1.5 grams of sugar per litre but must be less than 2% of the total volume), the addition of boise is a frowned upon shortcut. Those cognac houses that do add boise are unlikely to admit to it but the practice is all too commonplace. The addition of boise tends to show itself in a cognac by the oak flavours appearing disjointed. I personally believe that that the image of cognac and its appellation would greatly benefit from the outlawing of boise. This is the one area where the sometimes overly strict cognac appellation laws are too lax. 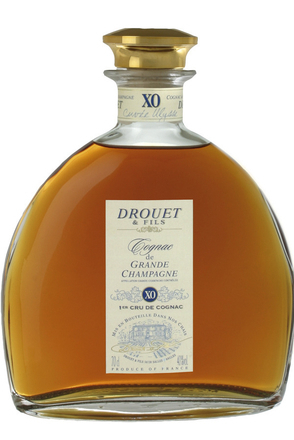 An eau-de-vie must spend a minimum of two years ageing before it can be termed cognac but generally spends two years and three months or two years and six months as eau-de-vie is distilled from November until March but confusingly, a cognac's age is counted from its second birthday, which is deemed to be on 1st April. V.S. or Three Star - This is the youngest and cheapest blend. The initials V.S. stand for 'Very Special' and the stars are thought to have originally celebrated the sighting of Halley's Comet during a particularly good year and originally indicated age with a star signifying each year of ageing. Only three star is now used in cognac and along with 'V.S.' these now indicate the youngest eau-de-vie in the blend will be at least Compte 2 (2½ years from harvest). V.S.O.P., Reserve or V.O. 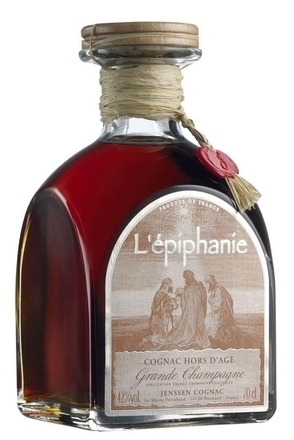 - The youngest cognac in the blend must be at least Compte 4 (4½ years from harvest). The term V.S.O.P. is now far more communally used over Reserve or V.O. and originated at the House of Hennessy. On October 7, 1817, England's Prince Regent and future King George IV sent an order to Hennessy for a 'very superior old pale' cognac. Thus this style and the V.S.O.P. classification were created. Napoléon - Courvoisier claim that the term Napoleon originated when they laid aside a brandy for Napoleon, who was planning to leave for the USA after his abdication. Napoleon Cognacs normally sit between VSOP and XO. Legally, Napoléon must be at least a Compte 6 (six and a half years from harvest), but they are often very much older. X.O., Vieux, Hors d'age, Extra - The term X.O. originates with Maurice Hennessy, who created his X.O. (Extra Old) blend of old eaux-de-vie for consumption by close friends and family. Like Napoléon cognacs, legally these cognacs must be at least Compte 6 (six and a half years from harvest) but this set to be increased to ten years reflecting the fact that X.O. cognacs are generally at least 15-20 years old. Vintage Cognac - While it is not permitted to put an age statement on cognac, the rules do allow for vintage cognacs made with eaux-de-vie from a single harvest and that year may be specified on the label. Sadly the production of vintage cognacs remains rare. Cognac is perhaps most notoriously sipped from a large brandy balloon but you will probably enjoy cognac more when drunk from a straighter sided, more wine-like glass. Cognac was originally drunk as a long drink simply diluted with chilled water and I am a huge fan of what is known as the 'Surfer' serve, long over ice either sparkling water, soda, lemonade, tonic water or ginger ale. 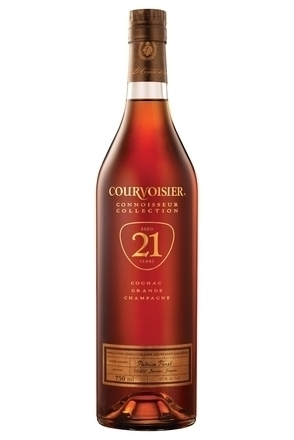 Cognac is also a versatile cocktail ingredient and generally mixes well with vanilla, ginger, citrus (especially lemon and orange) cranberry and grape juice. In 2010 cognacs total production volume was 555,000hl with worldwide sales of 12.8 million cases or 153 million bottles and total shipments valued at $1.86 billion. 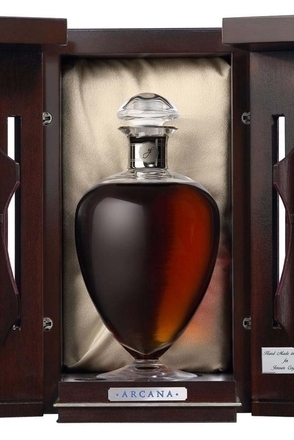 Every second, five bottles of cognac are sold in the world. The global market for cognac is spread between three major geographical zones, the Far East which accounts for 33.2% (4.42 million cases); Europe 30.5% (3.89 million cases) and USA, Canada and Mexico 32.2%. The U.S. the world's largest single cognac market by volume (3.89 million cases in 2010) while cognac's home French market is relatively small resulting in almost 97% exported. 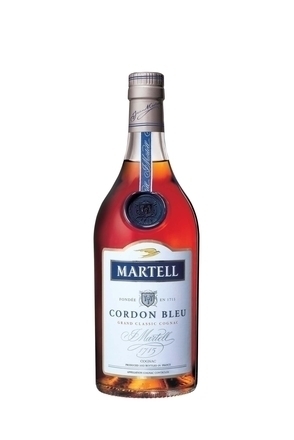 The four main houses, namely Martel, Courvoisier, Remy Martin and Hennessy account for some 80% of the cognac market with the remaining 20% covered by upwards of 300 smaller brands. Founded in 1946, the Bureau National Interprofessionnel du Cognac (BNIC), or Cognac National Board, is an association representing French growers and producers from the Cognac region.